Have you been to Argentina? When I was there a few years ago, Aaron and I ate chocolate-covered alfajores every single day. Alfajores are delicious in their simplicity: two buttery cookies with a layer of dulce de leche in the middle. If you buy alfjores pre-made in Argentina, they’re covered in chocolate. The crumbly cookie, smooth dulce de leche, and chocolate make a satisfying, yet not overly sweet treat (especially with coffee). Ok, now I’m just making myself want to go back to Argentina! Even though I have fond memories of eating alfajores in Argentina, I hadn’t thought about making them at home until I was chatting with my new friend Rosemary at the Women in Travel Summit last spring. 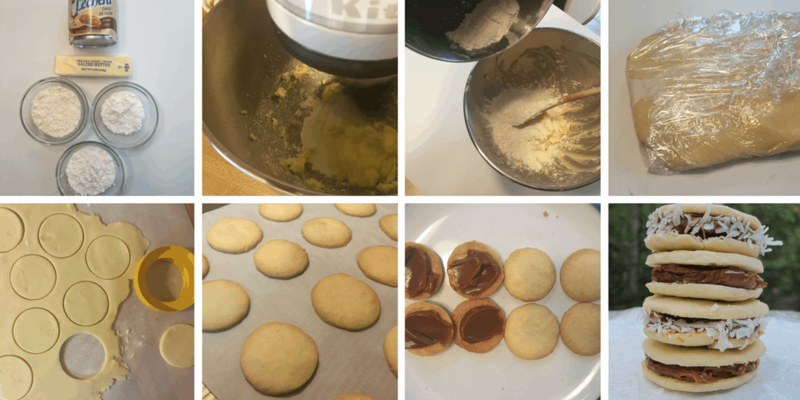 She mentioned having eaten homemade alfajores in Argentina, and that’s when I realized just how easy they are to make at home! 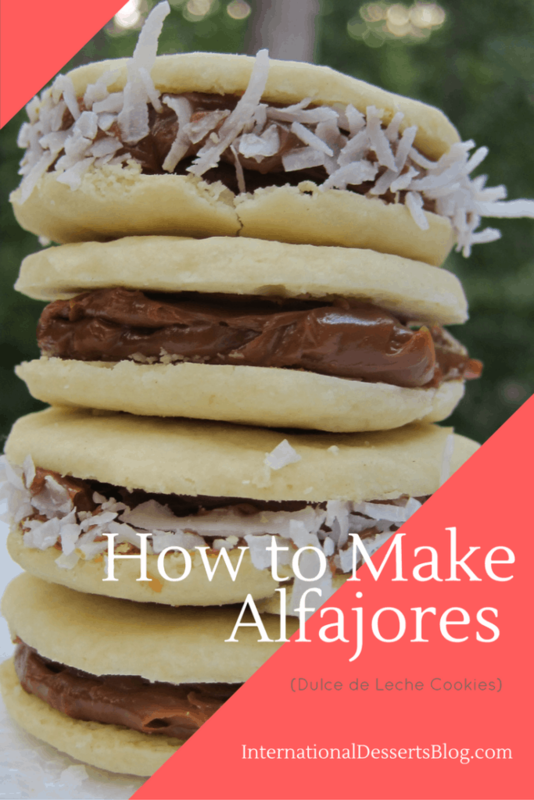 The alfajores ingredients list is small and it only takes a few minutes to mix the dough. You can make them plain, with coconut or covered in chocolate. 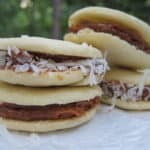 I made plain and coconut alfajores and found them both delicious. 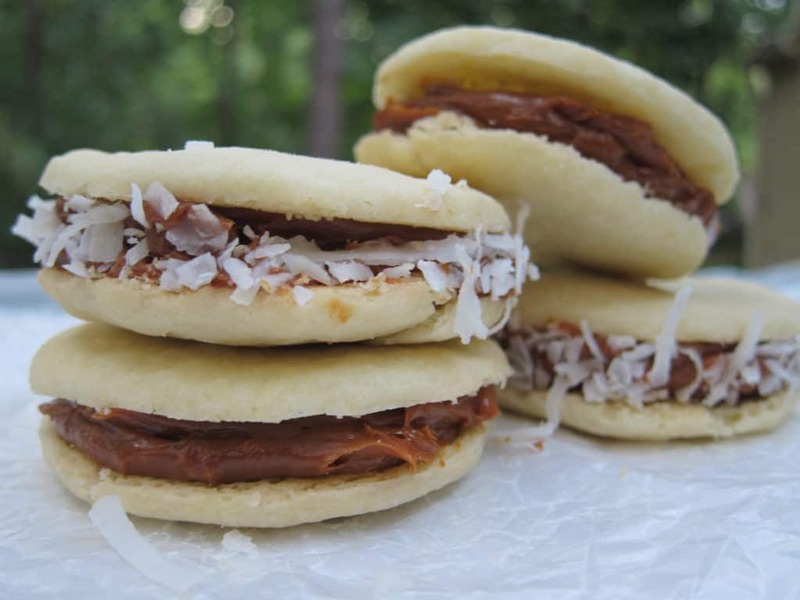 Keep a can of dulce de leche in your pantry for when you get an alfajores craving! The alfajores cookies are delicate and will break easily. Be very careful when transferring them from the baking sheet to the cooling rack and when spreading the dulce de leche. These alfajores taste different than the ones I remember eating in Argentina, but that could be due to the lack of chocolate covering. I’d planned to dip my alfajores in chocolate but after half of the broke when I added the dulce de leche, I decided against it. If you’re very careful and take your time, you might have better luck! These cookies are delicious in their simplicity: two buttery cookies with a layer of dulce de leche in the middle. Beat softened butter with powdered sugar until creamed. In a separate bowl, blend flour and cornstarch with a whisk. Mix dry ingredients with creamed butter and powered sugar using a wooden spoon until it just comes together to make a ball of dough. Knead dough a few times on a floured surface to ensure that all of the ingredients are well combined. If the dough is sticky, sprinkle a little flour on it. Flatten out the dough, cover with plastic wrap, and chill in the fridge for 30 minutes. Take dough out of the fridge and roll it out on a floured surface until it’s 1/4 inch thick. Sprinkle four on the dough as needed to keep it from sticking to the rolling pin. Use a round cookie or biscuit cutter to cut out cookies. A small jar or glass will work, too. Transfer cookies onto a baking sheet lined with parchment paper. Chill cookies in the fridge for 10 minutes. Bake for 10-12 minutes (until the edges are just starting to turn brown). Let cookies cool on a wire rack. Open a can of dulce de leche and stir with a knife. Carefully spread dulce de leche on one cookie. Gently top with another cookie. Optional: roll alfajores in shredded coconut or dip in melted chocolate.